El Camino means “the road”, and that’s where the dual personality El Camino is at home. It has all the good looks, smooth ride and sharp handling of a passenger car, plus the pickup bed can handle up to a half-ton of cargo in style. Inside the El Camino, there’s a look of luxury that lets you know you’re going first class. Under the hood, the El Camino comes with a wide range of engine choices, all the way up the horsepower ladder to the 454 c.i. in some years. The El Camino’s car-like styling and its work/play options of a truck have made it one of the most popular vehicles ever produced. 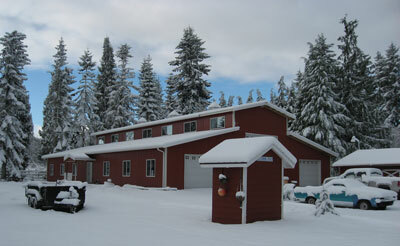 El Camino Manufacturing is dedicated to supplying superior reproduction parts. Since 1996, we have been officially licensed by General Motors as part of the GM Restoration Program. We have been serving El Camino owners, shops and parts dealers since that time. Wherever possible we use original GM tooling in the manufacturing of our parts. We are delighted that you have found us. 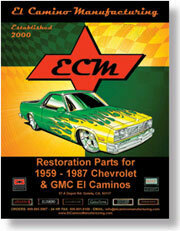 Many items in this catalog will bear the GM Restoration program logo. This means they have passed the rigorous quality testing of the Service Parts Operations of General Motors (GMSPO). We continue to develop new products. You can keep abreast of the most complete product listing right her on our website at www.elcaminomanufacturing.com. Today, the El Camino’s of yesterday are going through an exciting rebirth. They are being restored, rebuilt, customized and loved. El Camino Manufacturing is here to help. We share this love affair with all El Camino owners. We offer three levels of pricing. This catalog represents retail pricing only. To qualify as a dealer with El Camino Manufacturing, you must be in the business of retailing or wholesaling automotive products or accessories. Once you are approved as an authorized dealer, you will receive the dealer price list. If you are a body, trim or upholstery shop, please inquire. We have special pricing just for you! El Camino Manufacturing reserves the right to revoke any customer’s dealer or jobber status if, in the opinion of El Camino Manufacturing, the volume of the customer’s business no longer represents an automotive parts or service business.To open a dealer account with El Camino Manufacturing, please submit your request on company letterhead and enclose a copy of your current occupational license or state tax certificate. We don’t believe in buy-ins or minimums. We’ve felt the pain through the years of being a specialized shop and being forced to come up with huge buy-ins from big manufacturers. We promise not to do that to you. We pay special attention and give priority to dealer orders. We understand the need to fill customers’ orders as quickly as possible. We will do everything possible to ship your orders within 24 hours of receipt. Our products are guaranteed to meet or exceed OEM specifications in fit, look and quality. If you are unhappy with any of our products, simply return them within 30 days in resellable condition for a complete credit, refund or exchange. Please call or email us to obtain return authorization before returning parts. All products are warranted against defects in material and workmanship for 12 months from the date of shipment. We will replace the product or refund the purchase price at our discretion. This warranty does not cover labor or failure of a related component, failure resulting from faulty installation, nor does the liability of El Camino Manufacturing exceed the cost of the original component. El Camino Manufacturing will not be responsible for any damage or loss caused by delays, failures, or any other consequential damage arising from any cause whatsoever, nor for the labor, transportation or any other charges incurred in the replacement or repair of a defective item. We shall not be liable for personal or mechanical damage caused by the use or misuse of products. El Camino Manufacturing assumes no responsibility for improperly installed merchandise or misuse resulting in damage to the part. To keep down our overhead, we prefer fax and email orders. There will not always be someone available to answer your phone calls. If you need to speak with one of our representatives, please leave a message on our machine, and we will get back to you. All orders are shipped F.O.B. Port Angeles, WA. All orders will be shipped UPS unless otherwise specified. Shipping charges will be assessed when the package is boxed up and weighed. We make every effort to ship safely and efficiently. We accept Visa, Mastercard, Discover, American Express, Paypal and COD. El Camino Manufacturing will ship dealer orders COD (company check accepted) upon approval of a credit application. Customers not meeting the requirements for company check approval must pay their COD with certified check, cashier’s check or money order upon delivery. If something is damaged or missing, El Camino Manufacturing must be notified within 48 hours of delivery. We will not be responsible for shortages or damages after this period. Be sure to thoroughly check the box(es) for all items before submitting a shortage claim. Some products may be inserted in odd areas of the box for protection and are not readily visible. Returns will be accepted for up to 30 days from the date of the invoice. Returns must be authorized in advance by calling or emailing us. Customers will be charged a 20% restocking fee for refused, undeliverable or unauthorized returns. In addition, El Camino Manufacturing may require prepayment of all future orders. Checks returned unpaid will be billed an additional $35 service charge.